1 Homebodies originates from the American word homebody meaning a person who prefers pleasures and activities that center around the home; stay-at-home. (1) The homebody resides inside the American suburban home and in particular in the basement. 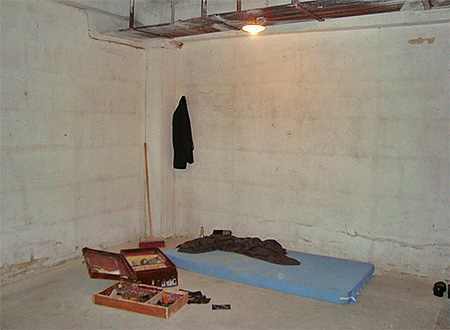 This subterranean level, often a renovated recreational basement is a place used for entertainment and storage. This is the starting point for the project yet reversed: a displacement of meaning, of not feeling 'at-home' is that which becomes in effect a program. The program aims to include multiple positions within the Homebodies complexity of place-making. (2) The basement program begins with the foundation of modernism's structures to reflect upon the relationship between the body and the home. Homebodies characterized by alienation, both the subject and site of the exhibition project. Altelierfrankfurt has generously hosted Homebodies to make the first exhibition of a series of three a reality. The project originally began in early 2007 with a call for international artists and developed further in email exchange. The process-orientated project advanced into an academic dialogue between academics and artists at the Homebodies conference Birkbeck College, London in November 2007. A discourse about how to make Homebodies meanings was created. Future planned exhibitions will take place in San Francisco and London. The first Homebodies exhibition will open the 8th of August 2008 and run until the 13th of September 2008 at the Atelierfrankfurt, Frankfurt am Main, Germany. Seven artists and one curator have produced this exhibition. Francisca Bancalari (Argentina), Ola Bielas (Poland), Keren Cytter (Israel), Teresa Gillespie (UK), Jonas Jensen (Denmark), Dirk Krecker (Germany), and Charlotte F. Smith (UK), have materialized works independently and or dependently within the Homebodies framework created by Annabelle von Girsewald. The sculptural and audio installations, videos, and textual based works investigate alienation and displacement in relation to the concept 'home'. (3) A voice can be heard from the headphone of the audio piece upon entering the basement. The viewer can listen to excerpts of Charlotte F. Smith's work titled, The Untitled Script of The Janes' childhood semidetached suburban nuclear family home pantry under the stairs, 2008. The artist-author performs and experiments with language exploring limits of female subjectivity in textual space. Excerpts taken from dialogues of the book performance of two acts employ CHARACTER 'A' ('the conscious self'), YOU ('the third party analyst'), and CHARACTER 2 ('the unconscious self'). Critical of the female role in the home; Character 'A' describes recollections of a fourth sub2 character, 'You' as opposed to YOU. You struggles to adopt cooking instructions for a roast beef dinner for 'a tired husband' while almost painfully inscribing 'MAID' on the chalkboard. The fragmented, multicharacter voice of the narrative describes a ritualistic tendency toward the domestic, including 'cleaningandorderingandcookingandfucking tasks', in an increasingly abstract, neurotic manner. The interweaving dialogues make reference to an anecdotal fifth character, Jane, as she writes the reader into an activation of the book where 'the story, your story, and the space between' is explored. The house, an unofficial character in the book has boards, which moan under infant footsteps, wallpaper which holds memories, and rooms, which frown when YOU leaves and CHARACTER 2 is left alone at the end to await the missing Act II. Who is speaking demanding us to reconsider Jane? Can looking homely ever be something positive? Francisca Bancalari investigates the psychology of space in her video, Quiet Room, 2007. Human extensions starting head to foot take on uncanny proportions. The corporeal is abstracted into a kaleidoscope of black strands of hair among flashes of white bed sheets. Here the unhomely physical and psychological de-stabilization of the body is represented. The bedroom houses psychological and architectural space for dreaming. Home in the sense of belonging has become highly accessible and portable subsequently due to globalization, mass migration and new technology. This experience is mediated by technology and creates new relationships between you and me. The role of the imaginary gains significance as real and imagined space begins to mirror each other. Ola Bielas' video Daniels Zimmer, 2005 reconciles the relationship between the imagined home and the real body. Foreign to her surroundings; the body comes into contact with the objects of home. Bielas performs IKEA furniture and documents the body getting to know the standardized city apartment. The concept of home is based on the illusion of safety and coherence created from exclusion and denial of differences. Uniform global structures at the beginning of the 21st century reflect exit architecture. 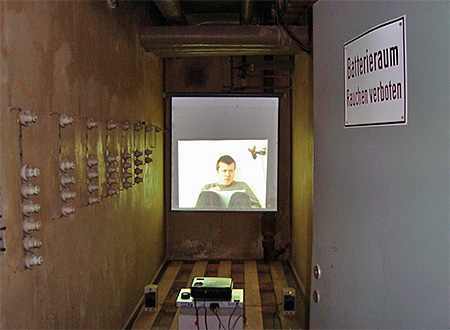 Transpassing Teresa Gillespie's character now finds himself in Frankfurt making the exhibition his home in her installation, from where to where, 2008. Is he really homeless? Where has he been and where is he going? The installation displays material remains of his presence. He discovers his own past as we together listen to how his story has been told giving mediated clues of his and others courses and consequences. 3 This period of displacement is marked by the dissemination of roots and no returns. What we have known and claimed as home transforms as soon as we leave, move on and revisit. Identity begins with the time and place of origin; manifesting itself in cultural practices, rituals, and forms of communication. How can we inherit former legacies and become responsible subjects? Dirk Krecker's installation, Psy border pitch 2 (we don't kill people we erase grids), 2008 oscillates between a sculptural landscape and geometrical shapes. The basement floor is covered in layers of uneven surfaces of cutout plywood. Retrospective the delicate momentary arrangement may collapse yet carries lessons for the future. The color display transmits the shape of change. Jonas Jensen presents the written documentation of his 24-hour Investigation of possible experiences of a Space No. 7 especially created for Homebodies in which he locks himself inside a building. Experiencing lasting structures of modernity is the site of struggle. Who wins in the end? The limited period of trials of survival inside the abandoned enclosed dark room is meticulously recorded. Jensen's thick description gives context to the images, smells, and sounds we are allowed to imagine. (4) Jensen translates the space and time into his experience in Danish, which is then translated into English. Keren Cytter deals with psychological space yet with past and present perspectives of its inhabitants on multiple levels. Cytter mixes up visual, spoken, and written communication forms in her video, Nothing, 2003. Treating these forms as everyday accessible readymades, Cytter questions memory, perspective, and nothingness. The protagonist enters into darkness to find a suitcase left by the apartment's former tenants. "Our eyes are the windows which our hearts reflect through them" is just one anthropomorphic analysis of the characters embodying space. Texts are dubbed and spoken in monologues in the video and the former tenants' voices in recordings and in film reels. Both fluctuate between Dutch and English. The viewer is challenged to read words typed on paper while listening to another reference, both strangely familiar. The philosophical reflection resolves in becoming a forgotten memory, 'nothing' accompanied by guitar music. The Homebodies experience is the correlation between the lived and imagined environments through visible and non-visible energies. (5) The tensions defining the relations between the subject and its environment are spiritual, physical, social, and mechanical. These seven artists and curator have materialized these documentations of 4 gestures, concepts, and language independently and or dependently of the Homebodies' framework. Where is the starting point: the home in the body or the body in the home? The curator's role has been one to facilitate, present, and define theses documentations as Homebodiesesque. The first basement exhibition program is about the uncanny, alienation from reality, not seeing or knowing being in the 'dark'. This program will continue to inhabit space in new ways. It is about accepting the danger of our habitat and staying in this darkness rather than to give in to desire to see as a whole. Home is a loaded word and contested site where identity can be manifested and materialized. Homebodies will continue to be re-defined by significant events such as this exhibition, as well as conferences, and finally how you make your meanings. 1. http://dictionary.reference.com/browse/Homebodies 2. Place-making is used as a strategy to create an ideological, political, and artistic place. See Okwui Enwezor, "Place-making or In the "Wrong Place": Contemporary Art and the Postcolonial Condition." In eds. Stéphanie Moisdon, Hans Ulrich Obrist: The History of a Decade that has not yet been named, (Zürich: JRPRinger), 2007, 219. 3. This exhibition the first of three reflects many ideas found in Nicolas Bourriaud's text ALTERMODERN, on the occasion of the pre-events of the Tate Triennale 2009. 4. Geertz, Clifford. "Thick Description: Toward an Interpretive Theory of Culture". In The Interpretation of Cultures: Selected Essays. (New York: Basic Books, 1973) 3- 30. 5. Frederick Kiesler, Endless House, Vienna, 2002. Kiesler (1890-1965) known for his design for Peggy Guggenheim's gallery "Art of This Century", dedicated his life to the unrealized project Endless House embodying his theories of correalism and continuity.